The Wrap Around Tree Bench is the perfect place to sit and ponder on the natural preschool playground. Install the Wrap Around Tree Bench around a tree on your playground to provide the children with a natural, shaded seating area. The seating area is perfect for children to lean against the tree and read a book or to sit and talk with friends. Add manipulatives to the area and the Wrap Around Tree Bench turns into a learning center that can be easily changed to fit the lesson plan for the day. For example, create a Science center by add magnifying glasses for the children to inspect the tree or add books to create an outdoor literacy center. 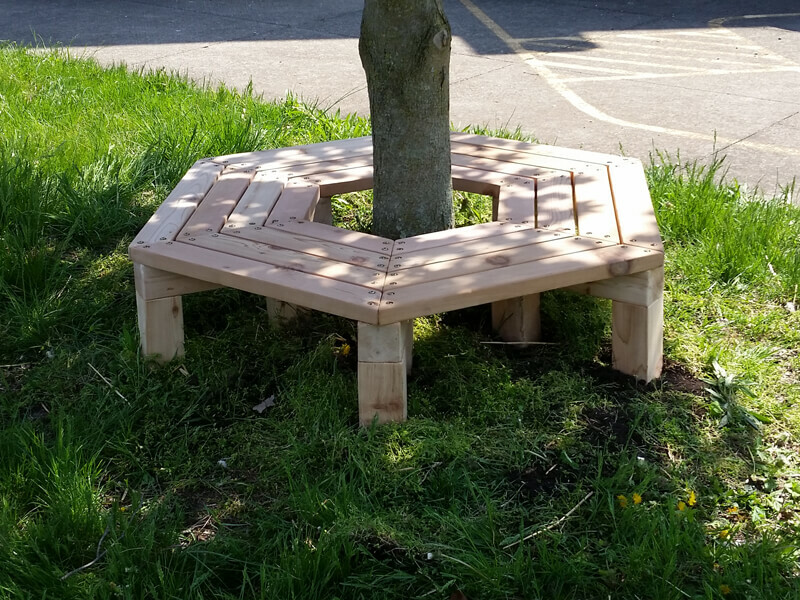 The Wrap Around Tree Bench is a hexagon shaped bench that is assembled around a tree on your natural play area. We have designed the bench to be 1′ high, which is the perfect sitting height for young children. However, we designed the bench with a width that is comfortable for an adult, to make it easy for adults to sit and interact with the children on the bench. Our Wrap Around Tree Bench has an 18″ diameter opening in the center for the tree. This will accommodate up to a 14″ diameter tree. If your tree has a diameter that is larger than 14″, we can create a custom sized Wrap Around Tree Bench for you. 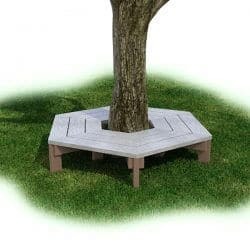 Please call us at 800-541-1954 for pricing on a custom sized Tree Bench. The Wrap Around Tree Bench is available in cedar to compliment a natural playground design or in maintenance-free plastic.